If you are a beginner at saying the Rosary, I suggest you look up the first two parts, before you look at this one. On part two, all the prayers we will use for the Rosary is there for you to learn. When you have done that then you are ready to put it all together. If you read through the Gospels you will find the story of Jesus’s birth, death and resurrection. The Gospels are the book of Matthew, Mark, Luke and John. It will help you to meditate on the rosary if you read through at least one of them such as the book of Matthew. First thing is you sign yourself of the cross, kiss the crucifix in reverence of Jesus Crucifixion. And then decide what you want to offer the Rosary up for. Then say the Apostles Creed. 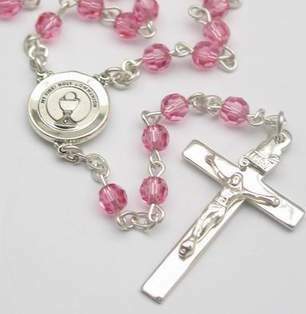 The next bead that follows after the crucifix is a bead all on its own, you say the Lord’s Prayer, then you move onto the three small beads that are together and on each one of them you say the Hail Mary prayer, then another bead that is on its own you then say the Glory Be prayer. Now you are on a medal of Mary on one side usually and Jesus on the other side of the medial. On this medial is at the beginning of the Rosary Beads circle. On this medial we will start with the Joyful Mystery. You might choose instead to say the Glorious Mystery if you wish. But we are going to start with the first mystery. So we will say ‘First Joyful Mystery The Annunciation’. And then you say the Lord’s Prayer, then you move to the left and you will see ten beads together and you meditate on each bead the mystery of the Annunciation, while you are saying the Hail Mary on each ten beads. After a while you will be able to recite the Hail Mary prayer even in your sleep if you say the Rosary enough times. I have found myself waking from sleep saying the Hail Mary prayer, it is not as uncommon as you think. The Annunciation mystery is when the angel Gabriel appeared to Mary who was a virgin and announced that she was to conceive a child who was to be called Y’shua (in Greek Y’shua is Jesus). So for the ten beads while saying the Hail Mary prayer you use your imagination with the help of the Holy Spirit. For example you may wonder what it would be like for Mary to get a message like that. If you read Luke 1:26-38 in your bible it will give you ideas what to think about. Then when you have finished saying Hail Mary ten times you then move onto a bead that is all on its own and you say the Glory Be prayer and then you say O my Jesus prayer then you say ‘Second Joyful Mystery The Visitation.’ Then you say the Lord’s Prayer. Once that is done you move down to the next ten beads that are together, and once again say the Hail Mary prayer on each and every bead while meditating on Mary’s visit to her cousin Elizabeth to help her, because she is much older and being pregnant herself. The child she is carrying is John the Baptist. Luke 1; 39-53, might help you to meditate on that mystery. When you finished that you then move onto the bead that is all on its own and say the Glory Be prayer and then the O my Jesus prayer and then you say ‘Third Joyful Mystery The Nativity.’ Then you say the Lord’s Prayer. Then you move onto the next ten beads and say Hail Mary on each and every bead meditating on the birth of Jesus. Luke 2, 6-19, might help you to meditate on Our Lords birth. When you finish that you saying the ten Hail Marys you now move on to another bead that is all on its own and you say the Glory Be prayer and then the O my Jesus prayer and then you say ‘Fourth Joyful Mystery The Presentation.’ Then say the Lord’s Prayer. Luke 2, 22-40, might be able to help you there. Now that you have done that you are now ready to begin the Fifth Joyful Mystery, doing what you have been doing with the other beads. Luke 2, 42-52 might help you to meditate on the fifth Mystery which is Finding Jesus in the Temple. So now we should be back to the medial, now you have two choices you either continue to the next ten beads doing exactly what you have been doing but this time it is going to be the Sorrowful Mysteries, or finish saying the Rosary altogether. If you decide to finish the Rosary you then say Glory Be prayer, then O my Jesus prayer, then the Hail Holy Queen prayer and then you finish off with this prayer below. Then you finish by signing yourself with the cross. I will just write down the different mysteries down so that you may be able to find them in the Bible. And I will write down some verses in the bible you might what to have look at so as to get an idea of the things that may help you to meditate on. In the Rosary you are free to meditate anything at all. Sometimes when I am meditating on the first joyful mystery, ‘The Annunciation’ for example I will try to imagine Mary waking up to another day, expecting maybe nothing in particular to happen and then she receives a visit from an angel asking her will she consent to be the mother of Jesus. What would it feel like to get a message like that out of the blew. So you see there is no hard and fast rules how and what you should meditate on. Let yourself be guided by the Holy Spirit. He will gladly assist you if you ask?